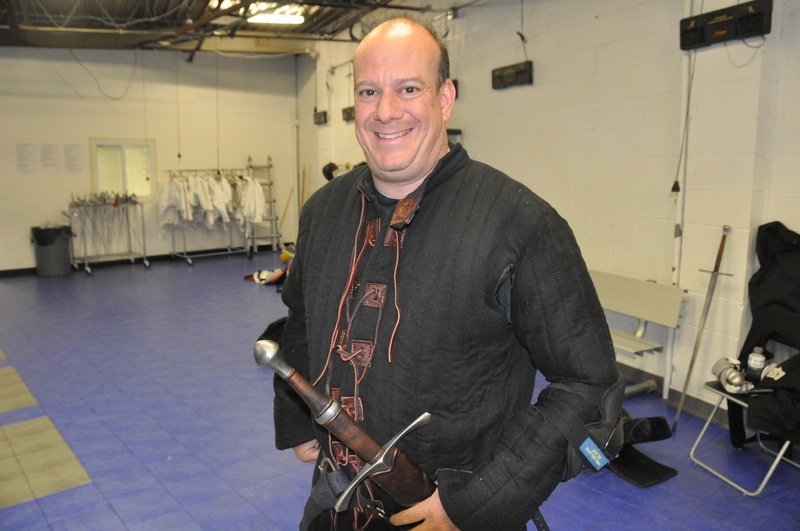 Brad Rangell is the co-founder of Long Island Historical Fencing Society (“LIHFS”) along with Mike Capanelli. LIHFS is currently studying Lichtenauer’s system with a particular focus on the Longsword and the practical application of its canonical techniques and plays. LIHFS also studies other weapon forms, including sword and buckler, dagger, spear, saber and others. The group is growing rapidly, with about 20 students who are currently attending regular classes. Since he travels often for work, Brad is lucky enough to be a true ‘journeyman’ and frequently studies with several well-known HEMA schools across the country and internationally as well, including Chicago Swordplay Guild (Greg Mele), NYHFA (Mike Edelson and Tristan Zukowski), London Longsword Academy (Dave Rawlings), Die Schlatschule (Hugh Knight), Meyer Friefechter (Mike Cartier), and several of Christian Tobler’s students, to name just a few. As a traveling ambassador, Brad strives to learn as much as he can and bring best practices to LIHFS and the HEMA community in general. Brad is a proponent of cross-training with other athletic activities and was a competitive runner in high school and college. Today, when he doesn’t have a longsword in his hands, Brad continues to be active in competitive tennis, roller hockey, basketball and other sports. Brad lives in Woodbury, Long Island, New York with his wife, two sons, and daughter Gracie (an eight year old Golden Doodle).